CleanSkinsSkin Correction & Anti-aging5 Reasons to Get a derma CIT Treatment ASAP! Scientifically proven to create new collagen by stimulating the skins natural healing process. Discover the derma CIT difference! With expert precision, technique and timing, your skin treatment therapist uses the derma CIT pen to trigger targeted growth factors for building new collagen, resulting in healthy, glowing skin. derma CIT treatments stimulate the production of your own natural collagen and promote the regeneration of skin cells via a natural healing process. This healing cascade means key cells in the skin (keratinocytes, melanocytes and the fibroblast) are activated to perform better, giving you stronger, healthier skin. The feeling is not as you’d think when you imagine needles piercing your skin. The RPM (or speed) is so fast that it tricks your pain receptors, making it a comfortable to pain-free treatment. If you feel uncomfortable at any point, your skin treatment therapist can adjust the depth, with the turn of a dial. Our Advanced Microneedle Cartridges utilise patented bio-sleeve technology to eliminate cross-contamination, prevent suction and reduce the risk of broken capillaries. Our medical-grade stainless steel needles minimise epidermal destruction and maximise results. Studies show that visible results are evident between 5 to 8 weeks post your derma CIT treatment, however most clients report that their skin feels and looks healthier and plumper the next day. 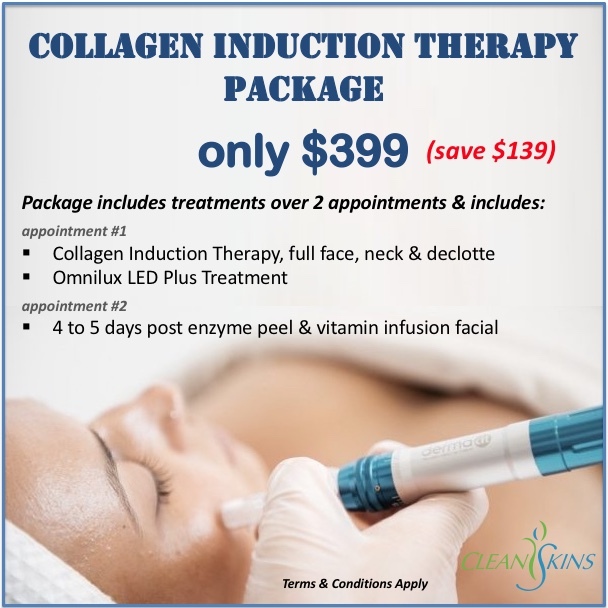 One of the most mind-blowing things about collagen induction therapy is that your results will continue to improve over the next 12 months as the new collagen and elastin settles, strengthens and rejuvenates your skin from within. Speak to your CleanSkins Skin Therapist about how this treatment can help you have the best skin you can! What is Collagen Induction Therapy (CIT) and what can it do for my skin? How Do I Get Rid of My Pigmentation?